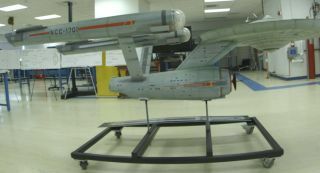 Curators from the Smithsonian National Air and Space Museum restored the original 11-foot (3.4 meters) model of the USS Enterprise, used in filming "Star Trek: The Original Series," as depicted in a new Smithsonian documentary, "Building Star Trek." A new Smithsonian Channel special gives Trekkies an unprecedented view of the efforts to save the USS Enterprise from certain death. The documentary shows museum officials fighting against decades of damages to fix the 11-foot (3.4 meters) "Star Trek" ship model, used in filming the original series, before putting the ship on display. In between exclusive clips at the National Air and Space Museum in Washington, the documentary — called "Building Star Trek" — also shows the construction of a new "Star Trek" exhibit at the EMP Museum in Seattle, featuring props used in the original series. The special airs Sept. 4, just four days before the 50-year anniversary of the first broadcast of "Star Trek." Besides showcasing awesome props, the show has inspired nearly two generations of scientific innovation, the documentary reveals. "The 2-hour special also profiles a new generation of engineers and scientists who are making 'Star Trek's' visionary technology real, pushing the boundaries of physics with inventions first conceived on the iconic series: warp drives, medical tricorders, cloaking devices and tractor beams," Smithsonian representatives said in a statement.